say that you are almost certainly going to stay dry. Yep, that’s right. Your wet-suit which we will supply is merely a formality! You’ll be on a board that is so stable that all you’ll need to do is enjoy yourself. Those are our primary goals for your first session, that you finish dry, and with a big smile, keen to get out for some more. The format for a beginner lesson is simple. Starting off on dry land, we familiarise you with the paddling and turning techniques, and that all-important first stand-up. 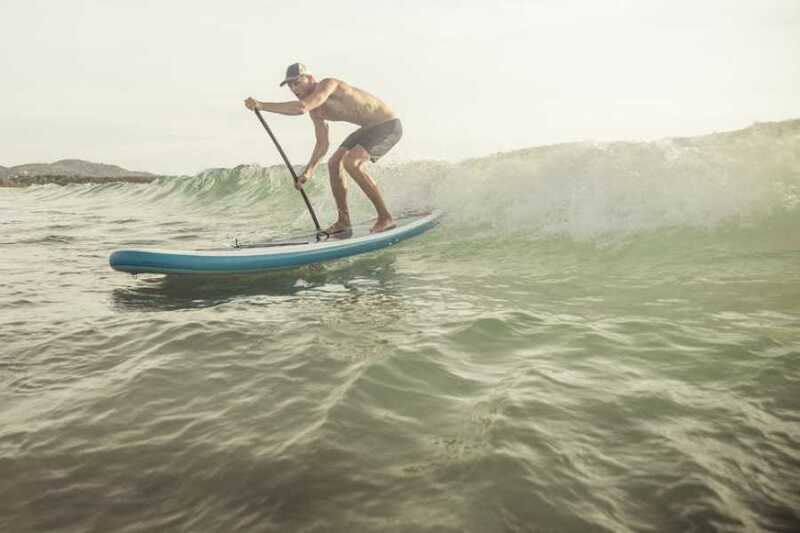 Once we’re confident that you’ve got the hang of it, we all get out onto the water, and paddle around for a while in the kneeling position (we call it the ‘safe position’), until you’re comfortable with paddling, turning and generally being on a board. Then we’ll get you up into the stand-up position, and head off for a cruise. The session will normally last about 80-90 minutes all in. How to safely fall off and how to get back on your board. Duration approximately 90 minutes. Please contact us for availability. The lesson will take place at the most sheltered, safe piece of water we can find for you. This will be at Baginbun Beach or Cairnivan Beach in Fethard-On-Sea Co Wexford. We decide the location on the day pending weather conditions. There will be no waves or surf to put you off or make it harder. We guarantee that you will be standing up and paddling in that first session. You may think you have dreadful balance, or are not fit enough to manage it, but the truth is that if you can stand up, you can stand-up paddleboard. We have taught many people over the past year, and have a huge repertoire of tricks and techniques up our sleeve. Rarely have we not been able to get someone up and going on their first session.